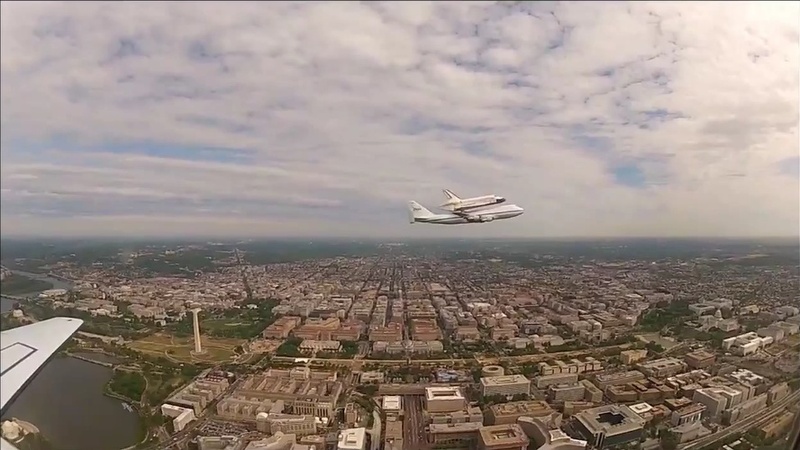 Nasa released a video of the space shuttle flying around DC that was taken from the chase plane. 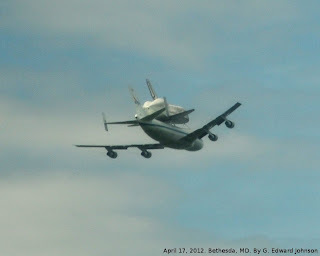 After a bit of looking, I identified where it flew over Bethesda, MD. Above is a frame from that video. It is only the southern end of Bethesda, with Friendship Heights in the distance. You can see Bradley Blvd, Wisconsin Ave and some of the stores near there. This was from the first flyover, so around 10:10 am on April 17th. 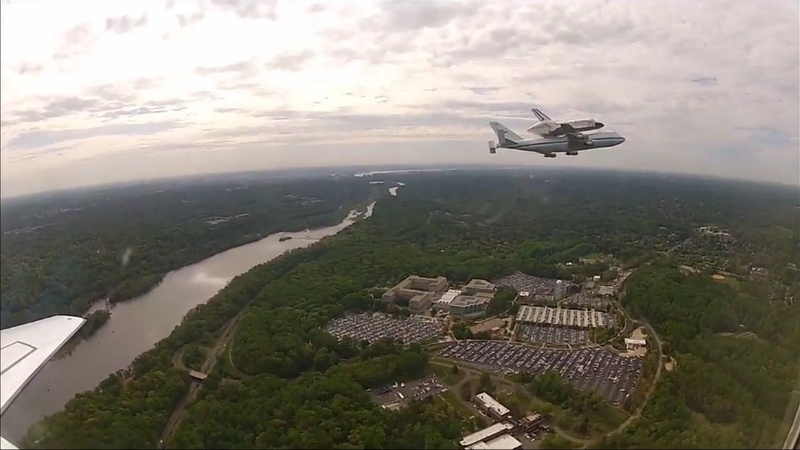 After going by Bethesda Discovery crossed the Potomac River (left side of the frame) and went over the CIA in Langley. Here is the shuttle flying by the National Mall in DC. You can see the Washington Monument on the left and the Capitol building on the right. These pictures come from a nasa video, which, like all products of the US Government, is in the public domain. 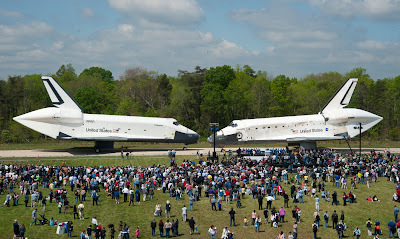 Here's another NASA picture, this one is of the space shuttle Discovery and Enterprise facing each other on a runway. the original is here. 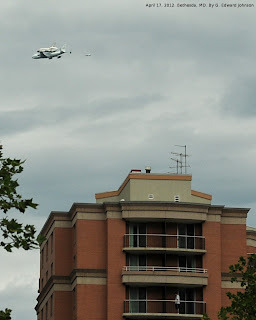 Yesterday we had a real treat, the Space Shuttle Discovery flew directly over Bethesda, MD. Twice!. 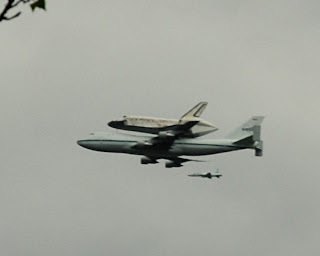 The above picture shows it, mounted on it's 747 transporter plane and followed by a chase plane as it flew past the apartment building with the Caribou Coffee shop in it. The first pass was at 10 minutes past 10 am, it flew almost directly over the building I was in. I could hear the plane before I could see it and it just appeared at the top of the window, flying towards the Potomac River. Here is a picture from the second pass, about 20 minutes later. 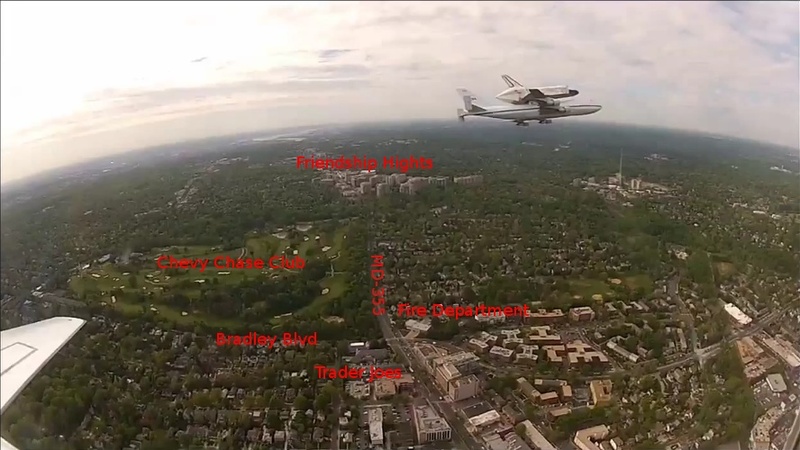 The shuttle was only about 1,500 feet above the ground, and it looks like it flew over the southern part of Bethesda Navel Medical.